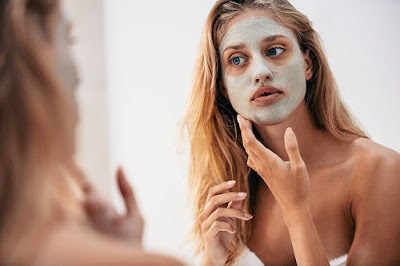 Listed below are some easy and natural skin tightening mask recipes that you can easily make at home. You can use any one or two of these tightening masks at least twice a week for wrinkle free skin. Peel the banana and make a paste using fork or hand with no lumps then add honey and olive oil to it. Mix all ingredients well and apply this banana mask all over your face and neck. Let it stay for 20 minutes and then rinse with cool water. Try to use this mask at least once in a week. Banana is high in fats which can keep your skin hydrated and moisturized. Antioxidants in Honey and olive oil will repair the damaged skin cells. Take one egg white then mix it with yogurt, 1 teaspoon of lemon juice and little sugar. Apply this mixture on your face and wait for until it gets dry then wash it off. Use this mask once in a week to notice results. Egg whites and lemon have astringent properties that shrink the pores by tightening the skin. Yogurt cleanses your skin and sugar works as natural exfoliator which can eliminate dead skin cells and reverse aging signs. Make a fine paste with multani mitti by adding sufficient milk to it. Spread this paste evenly on all over your face and neck. Let it sit for 15 minutes or until it gets dry then rinse with normal water. Use this multani mitti face mask once in every week for at least a month to see good results. Fuller’s earth fights with pimples, blemishes and improves your skin tone. Milk protects your skin from damage and make your skin softer. Blend the oats into a powder and add gram flour, honey and rose water to make a paste. Apply this oat meal mask to your face and leave it for 15 minutes then clean with warm water. Try to use this face mask once in a week. Oatmeal absorbs the impurities and dirt stayed in your skin pores. Antioxidants in oats helps in soothes the skin and it protects your skin from free radical damage. Gram flour and honey avoid the natural aging process and keep your skin nourished. Combine all these ingredients in a bowl and make a fine paste. Spread the mask evenly on all over your face and neck. Let it get dry for 15 minutes then wash your face. Use this clay mask once or twice in a week. Clay masks are excellent for skin tightening, it reduce the appearance of scars, cleanses the skin and and gives you an even skin tone. Add lemon juice to the castor oil and mix well. Apply this mixture on your face and neck then massage for a few minutes in a circular motion. Leave it for half an hour or on overnight then rinse with lukewarm water then followed by cool water. If you do this Castor oil massage once or twice in a week you get the best results. This is an excellent skin conditioner and help you get rid of skin dryness and dry patches on your face in just a few applications and make your skin soft and smooth. You can also use almond oil, coconut oil and olive oil to this recipe.